I, with my wonderful congregation Leyv Ha-Ir, celebrated Purim, the wild and crazy Jewish holiday celebrating the downfall of Haman (boo! ), who as vizier to the Persian King tried to massacre all the Jews in the realm; but his plan was foiled by Mordechai (yay!) entering his beautiful cousin Esther (woo hoo!) into a beauty pageant to be the queen, and Haman’s plot was foiled. It’s the celebration of the downfall of a tyrant; the world has been full of them, people who have become legends in their own minds, such as Mubarak in Egypt, Ghadaffi in Libya, and Assad in Syria. There are also mental Hamans as well, within our psyches, such as low self-esteem and self-doubts, which we daily must overthrow; I know, I deal with them as well. Now coming up is the holiday of Passover, the liberating of the Jews from Pharaoh’s slavery in Egypt. The traditional word for Egypt in Hebrew is Mitzrayim, “the narrow place,” the place of limitation. There are Pharaohs in the word today-political dictators for one thing, also abusive relationships-as well as internal Pharaohs, like the voice inside you that says, “I’m not good enough, I’m not smart enough, I can’t do it.” Those dictators and tyrants, inside and around you, also need to be vanquished. This election, by consensus, should never have happened while Syria further intensifies its violation of human rights. In yet another sign of moral obtuseness and incoherence in policy at the U.N., the business-as-usual approach to Syria at UNESCO soon preceded a General Assembly committee’s condemnation of the Damascus regime’s continuing domestic brutality. Indeed, the Arab League itself has decided to suspend and possibly sanction Syria. 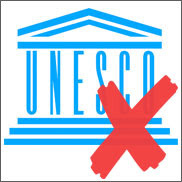 B’nai B’rith calls on UNESCO’s Executive Board to immediately revoke Syrian membership in all committees at the U.N. agency. Durban III: Katrina Lantos Swett travels in her father’s footsteps. As the start of Durban III quickly approaches, I have often thought back to the first Durban conference which degenerated into a global diplomatic pogrom aimed at demonizing the Jewish state of Israel. My father, the late Congressman Tom Lantos, was proud to lead the walkout of the official US delegation from that shameful farce that he referred to as the Durban Debacle. So while much of the world is optimistically celebrating the hoped for dawn of a new “Arab Spring”, this gathering in New York is yet another reminder of the challenges that we continue to face. Photo (right): Rep. Tom Lantos and his wife, Annette, left the press center at the racism conference in Durban, South Africa. Lantos said the conference was “hijacked by extremist elements.” Associated Press photo by Karel Prinsloo. At the Lantos Foundation, we share the hope for a more democratic and progressive future for the Middle East, but the Durban meeting is another sign of concern. We are alarmed at the naïve and dangerous willingness of too many in the West to ignore the appalling and disturbing anti-Semitic and anti-Israel rhetoric that is spewing forth from many of the new revolutionary leaders in Egypt, Tunisia, Libya and elsewhere. And lest anyone be tempted to dismiss such displays as regrettable but harmless chatter, I would remind you of the violent assault on the Israeli Embassy in Cairo just a few days ago. I will travel to New York this week armed with the determination to continue fighting against the scourge of anti-Israel sentiment that will surely be on display. As a child of the only Holocaust survivor ever elected to Congress, I will focus on continuing my father’s legacy of standing up to the ever present danger of hatred and anti-Semitism.